Offer Terms: Min first deposit of £5. First deposits receive 500% bonus up to £100 max (eg. £20 dep = £100 bonus). Cash out requires 4x wagering with regards to bingo bonus & 80x with regards to games bonus. Wagering requirements vary by game. The 888 Bingo platform launched in 2009, and belongs to the popular 888 Holdings PLC Group and Cassava Enterprises Ltd in Gibraltar. The brand was already extremely well known for its sports, casino and online gaming offerings, so therefore ventured into bingo with this fantastic platform which operates on the Dragonfish bingo software. The site itself is fairly plain in style, with simple colours and navigation. Everything is labelled clearly and concisely, and you won’t be overwhelmed with flashing logos or gimmicks. All the gaming and promotions are super easy to find, and you’ll see plenty of bingo schedules and winners tables throughout. This is a great way to see whats up and coming, and also to keep on eye out for fellow roomies along the way. The bingo offerings come in either 75, 90 or High 5 variant games, with jackpots reaching up to £1000,000. The High 5 bingo is a rarer found format, and provides players an exciting 5 ways to win. You will also find a small variety of slots titles too including X Factor Steps To Stardom and Deal or No Deal. It’s not as big a choice compared some other sites, but all games and jackpots are really high quality. The promotions on offer are fairly varied, with a great initial welcome bonus up for grabs. Other bonuses can be picked up along the way during fun chat games, aswell as fantastic promotions which are updated form week to week. There is also a great loyalty scheme in place, where players can earn points for prizes throughout your 888 bingo experience. 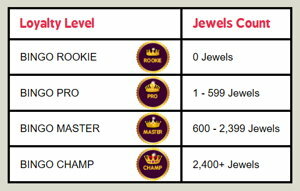 The more you play, the more you win so climb those loyalty levels and cash in big. The welcome offer at 888 Bingo is one of the most exciting around. You will find a link at the top of the page, and terms, conditions and elibility criteria apply. All players must be aged 18+ to register. If you enjoy a touch of late night daubing, then try your luck out on the Late Night Show. Win up to £100 in real money, and tickets cost just 1p a card. Join the monthly 2 Million Race, where 40 players can win up to 2 Million loyalty points. If weekend bingo is more your thing, then grab your tickets for the fantastic Weekender games. Tickets cost as little as 5p, and the prize is pool is a whopping £700. There are plenty of great offers here to keep you busy. The Big £10K is played on every 10th of every month, and there will be a £5000 prize pool for winners, with a further £5000 split between everyone else. Whether you’re a roaring Leo or a daring Aries, you’ll want to get involved with Zodiac bingo. This game takes place on the 21st of every month, and there is a guaranteed jackpot of £1,111 up for grabs. 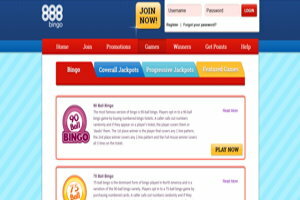 888 Bingo is copyright to Cassava Enterprises Ltd in Gibraltar, a wholly owned subsidiary of 888 Holdings PLC. The Site runs on the Dragonfish Bingo Software. The main variants of bingo on offer at 888 Bingo come in either 75 and 90-ball games, or the bingo special High 5 game. All games are spread across several fun themed rooms, and the High 5 bingo variant offers players a fantastic 5 ways to win. The schedule for bingo games can be located easily in the main lobby and tickets start at just 1p a game. There isn’t a huge choice of bingo on offer, but all the rooms have a nice intimate and friendly feel. The 888 Bingo platform also incorporates several featured games alongside its bingo options, just in case you should feel the need for some high rolling. There are several popular slots titles available including Jack and the Beanstalk, Starburst and Cleopatra. Again, not the widest choice compared to other sites but it is an option should you wish to venture into something other than bingo. Please read all terms and wagering requirements upon registration, as details are always subject to change. Bingo wager is 4x bingo bonus. Games wager is 80x games bonus. Overall, 888 Bingo is a really great site. It may not have as big a variety of bingo and additional gaming as some other sites, but everything available is of a really high quality. The 888 brand is very trusted, so you know you’ll be playing in very safe hands, and the promotions and prizes are just as exciting as other competitors. The site itself is simple and sleek in design, so you won’t be baffled with too much themeing or flashing graphics. The bingo shedule is always easily on hand, so you’ll never miss out on your favourite games. This may be a good site if you’re new to online bingo, as its super simple to navigate and the bingo offerings are very classic. The welcome offer is really great value, and allows new players to get the most out of the site on a first deposit. If you’re looking for a site that is classic and simple in style, then give this well established brand a whirl.